Brushing your teeth with a strip of fried bacon is tricky. If it's too crisp it will break apart as you brush and if it's too limp you won't be able to remove any of the plaque. 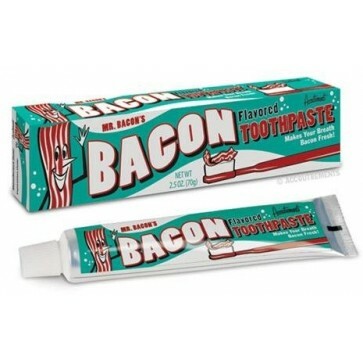 So when it's time to brush your teeth, leave the bacon strips for breakfast and try this Bacon Toothpaste. It's the perfect way to keep your teeth and gums healthy while coating your mouth with the delicious flavor of smoky meat! Each tube contains 2.5 oz of potent paste.